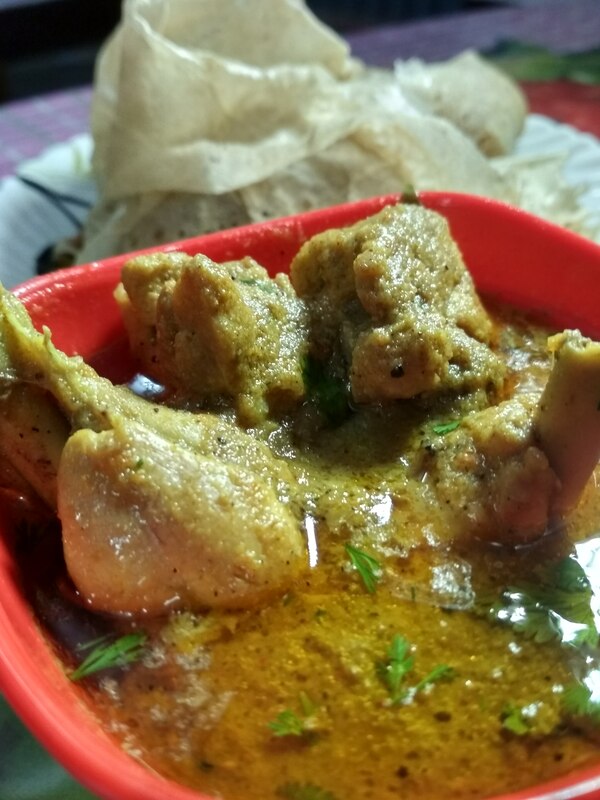 korma is one of the most famous muglai dish korma is basically made with vegetable or meat braised with curd.chicken korma is one of the most famous dishes among non-veg lover. some korma dishes are the combination of vegetable and meat, korma gets it flavor from the dry spices and fresh ingredients with yogurt.traditionally for making korma dish are cooked on charcoal fire. this provides all-round heat. 800 gm chicken cut into small pieces. 1/2 tsp red chili (lal mirch)powder. 1 tsp spices mixture(garam-masala) powder. 1 medium size sliced onion. 3 tbsp of curd (dahi). 2 tbsp of ginger paste. 2 tsp of garlic paste. 2 small size Bay leaf(tej patta). 1 tbsp red chili powder. 1/2 tsp turmeric (haldi) powder. In a mixing bowl marinated the chicken using above mention marinated ingredients.and keep it aside for 45 minutes. heat the oil in a frying pan and add sliced onion and stir it till it turns little golden brown. next, add soaked cashew nuts and stir it for a minute or till it turns golden brown.keep the flame low to moderate. cool and blend the onion cashew mixture and prepare the smooth paste. also add curd as well. Use the same pan and add heat the oil. Once oil gets heated add all the dry spice one by one and saute it for at least 2 minutes or till the spices changes its color. keep the flame low. next, add ginger garlic paste, red chili powder, turmeric powder ,garam masala, and salt and saute the mixture in low flame until the smell of raw ginger garlic paste goes away. add marinated chicken along with the marinate also add also add onion paste. boil and simmer the mixture for 5 min low flame. next, add 1 cup of water and cook the mixture until chicken turns tender. cook the gravy till you find the right consistency. for garnishing, you can use fresh coriander and mint leaves. enjoy the chicken korma recipe . use white skin and flesh do not use yellow skin and flash chicken. while cooking the chicken masala can stick to the bottom so to avoid this try to use non-stick pan or kadhai. if you are using small pieces of chicken there is no need to pressure cook .for large size chicken pieces you can cook in pressure cooker for up to 2 whistles. Make sure the chicken pieces cut properly especially from the joint otherwise while cooking meat starts loosing from the bones. For juicy, tender and uniformly cooked chicken pieces cook in moderate to low temperature. high temperature squeezes out the juice and makes chicken pieces hard.